Some attacks move your hurtbox away from your base position. The gfy illustrates this disjoint with fox's ftilt. Marth connects a hit on fox's foot when it was extended forward. Fox's position (illustration by the center of the diamond) has not changed though, and so when he is hit, his hurtbox moves back to his position. This can result in perculiar animations, as it seems as if Marth gained unexplained range. Randall (the cloud on Yoshis), moves along a set path, and it does this within specific time intervals. This gfycat teaches you the timing of randall, by observing the timer at the top. These maps show precisely what movement/attack is triggered at varying points of the control stick, each map representing a different state the character is in. Click Full album below to see the complete set. 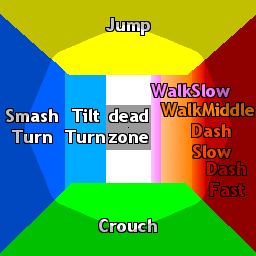 This gfycat shows the varying distances Falcon skids when performing smash turns from different movement options. This is mainly for pc drops. The top 2 Falcons dash back by hitting back for more than 1 frame, but they still skid for a small distance before they move back. The 3rd and 4th Falcon only smash back for 1 frame, and so perform an empty turn (pivot) and skid much further. Although this gfy is of Falcon, the concept is very general and Falcon is very much an extreme case, where his Dash is much better than his Wavedash, and yet Wavedash produces more skid.